(STAFF REPORTS- The Standard of Hendersonville. Click HERE for full article) Second Harvest Food Bank of Middle Tennessee has officially launched its Hunger Free Summer campaign to provide 4 million meals. 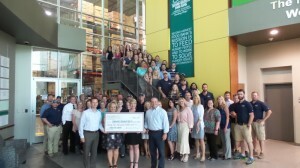 Employees from Goodall Homes, the official Hunger Free Summer sponsor, presented a $25,000 check in support of the campaign. The donation will provide 100,000 meals. Summertime means thousands of children no longer have access to school meals, and parents are left struggling to provide. Second Harvest has set a goal to provide 4 million summer meals for children and their families to help make this a Hunger Free Summer for all. One of the ways Second Harvest is addressing childhood hunger is through the sponsorship of 31 Summer Food Service Program (SFSP) sites across its 46-county service area that serve meals to children throughout the summer months. In addition to food, many sites provide educational enrichment and recreational activities that help children continue to learn and stay safe and active while school is not in session. In Middle Tennessee, one in five children, 21.9 percent, in Second Harvest's 46-county service area are food insecure, totaling 141,710 children. Food insecurity is defined by the USDA as limited or uncertain access to enough food to support a healthy life. Although food insecurity is harmful to an individual, it can be particularly devastating among children due to their increased vulnerability and the potential for long-term consequences. About Second Harvest Food Bank of Middle Tennessee Organized in 1978, Second Harvest Food Bank of Middle Tennessee is a private, not-for-profit, tax-exempt organization. Second Harvest's mission is to feed hungry people and work to solve hunger issues in our community. Second Harvest distributes food and other products to approximately 450 nonprofit partner agencies in 46 counties in Middle and West Tennessee. Our partners include food pantries, soup kitchens, shelters, childcare facilities, senior centers, group homes, and youth enrichment programs. For more information on Second Harvest Food Bank of Middle Tennessee and its programs, please visit secondharvestmidtn.org. About Goodall Homes Goodall Homes, a Berkshire Hathaway Company, builds single-family homes, townhomes, courtyard cottages and villas throughout Middle Tennessee. The Goodall Homes team mirrors Bob's commitment to service and excellence in homebuilding. This commitment has been recognized through awards such as the Builder of the Year by Professional Builder magazine (2014); NAHB National Housing Quality Silver Award (2016); NAHB National Housing Quality Bronze Award (2012), The Nashville Business Journal's Fastest Growing Private Companies 2015, 2014, 2013, 2012; The Tennessean's Top Workplaces 2015, 2014, 2013; and The Nashville Business Journal's Best in Business Award. For more information about Goodall Homes, please visit GoodallHomes.com.